Considering how long Reneé Sieber (McGill University) and I know each other, and working in similar areas (participatory GIS, participatory geoweb, open data, socio-technical aspects of GIS, environmental information), I’m very pleased that a collaborative paper that we developed together is finally published. The paper ‘The epistemology(s) of volunteered geographic information: a critique‘ took some time to evolve. We started jotting ideas in late 2011, and slowly developed the paper until it was ready, after several rounds of peer review, for publication in early 2014, but various delays led to its publication only now. What is pleasing is that the long development time did not reduced the paper relevancy – we hope! (we kept updating it as we went along). Because the paper is looking at philosophical aspects of GIScience, we needed periods of reflection and re-reading to make sure that the whole paper come together, and I’m pleased with the way ideas are presented and discussed in it. Now that it’s out, we will need to wait and see how it will be received. Numerous exegeses have been written about the epistemologies of volunteered geographic information (VGI). We contend that VGI is itself a socially constructed epistemology crafted in the discipline of geography, which when re-examined, does not sit comfortably with either GIScience or critical GIS scholarship. Using insights from Albert Borgmann’s philosophy of technology we offer a critique that, rather than appreciating the contours of this new form of data, truth appears to derive from traditional analytic views of information found within GIScience. This is assisted by structures that enable VGI to be treated as independent of the process that led to its creation. Allusions to individual emancipation further hamper VGI and problematise participatory practices in mapping/geospatial technologies (e.g. public participation geographic information systems). The paper concludes with implications of this epistemological turn and prescriptions for designing systems and advancing the field to ensure nuanced views of participation within the core conceptualisation of VGI. The paper is open access (so anyone can download it) and it is available in the Geo website . The second day of the Data and City Workshop (here are the notes from day 1) started with the session Data Models and the City. Pouria Amirian started with Service Oriented Design and Polyglot Binding for Efficient Sharing and Analysing of Data in Cities. The starting point is that management of the city need data, and therefore technologies to handle data are necessary. In traditional pipeline, we start from sources, then using tools to move them to data warehouse, and then doing the analytics. The problems in the traditional approach is the size of data – the management of the data warehouse is very difficult, and need to deal with real-time data that need to answer very fast and finally new data types – from sensors, social media and cloud-born data that is happening outside the organisation. Therefore, it is imperative to stop moving data around but analyse them where they are. Big Data technologies aim to resolve these issues – e.g. from the development of Google distributed file system that led to Hadoop to similar technologies. Big Data relate to the technologies that are being used to manage and analyse it. The stack for managing big data include now over 40 projects to support different aspects of the governance, data management, analysis etc. Data Science is including many areas: statistics, machine learning, visualisation and so on – and no one expert can know all these areas (such expert exist as much as unicorns exist). There is interaction between data science researchers and domain experts and that is necessary for ensuring reasonable analysis. In the city context, these technologies can be used for different purposes – for example deciding on the allocation of bikes in the city using real-time information that include social media (Barcelona). We can think of data scientists as active actors, but there are also opportunities for citizen data scientists using tools and technologies to perform the analysis. Citizen data scientists need data and tools – such as visual analysis language (AzureML) that allow them to create models graphically and set a process in motion. Access to data is required to facilitate finding the data and accessing it – interoperability is important. Service oriented architecture (which use web services) is an enabling technology for this, and the current Open Geospatial Consortium (OGC) standards require some further development and changes to make them relevant to this environment. Different services can provided to different users with different needs [comment: but that increase in maintenance and complexity]. No single stack provides all the needs. 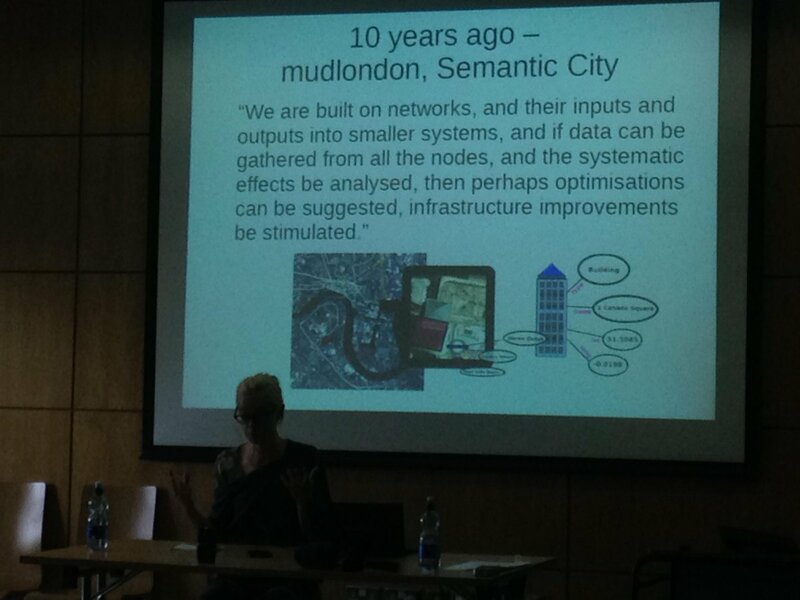 Next Mike Batty talked about Data about Cities: Redefining Big, Recasting Small (his paper is available here) – exploring how Big Data was always there: locations can be seen are bundles of interactions – flows in systems. However, visualisation of flows is very difficult, and make it challenging to understand the results, and check them. The core issue is that in N locations there are N^2 interactions, and the exponential growth with the growth of N is a continuing challenge in understanding and managing cities. In 1964, Brian Berry suggested a system on location, attributes and time – but temporal dimension was suppressed for a long time. With Big Data, the temporal dimension is becoming very important. An example of how understanding data is difficult is demonstrated with understanding travel flows – the more regions are included, the bigger the interaction matrix, but it is then difficult to show and make sense of all these interactions. Even trying to create scatter plots is complex and not helping to reveal much. The final talk was from Jo Walsh titled Putting Out Data Fires; life with the OpenStreetMap Data Working Group (DWG) Jo noted that she’s talking from a position of volunteer in OSM, and recall that 10 years ago she gave a talk about technological determinism but not completely a utopian picture about cities , in which OpenStreetMap (OSM) was considered as part of the picture. Now, in order to review the current state of OSM activities relevant for her talk, she asked in the OSM mailing list for examples. 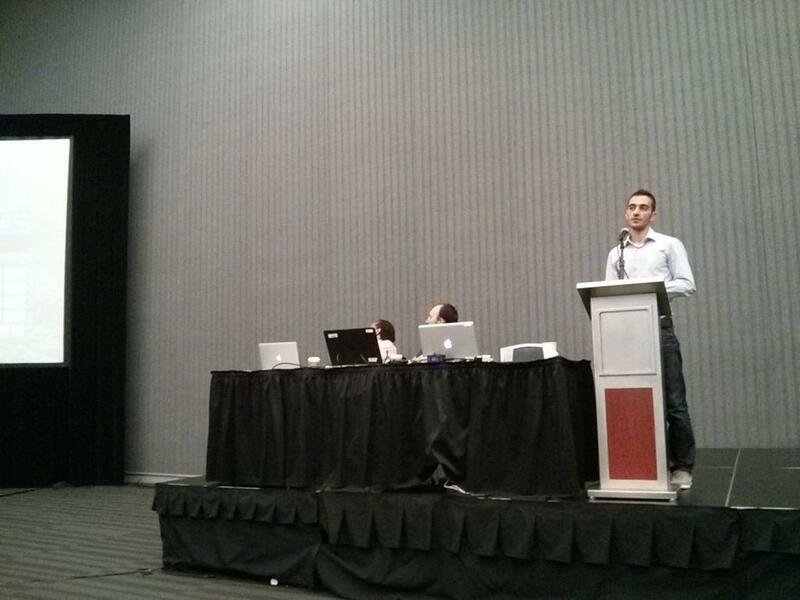 She also highlighted that OSM is big, but it’s not Big Data- it can still fit to one PostGres installation. There is no anonymity in the system – you can find quite a lot about people from their activity and that is built into the system. There are all sort of projects that demonstrate how OSM data is relevant to cities – such as OSM building to create 3D building from the database, or use OSM in 3D modelling data such as DTM. OSM provide support for editing in the browser or with offline editor (JOSM). Importantly it’s not only a map, but OSM is also a database (like the new OSi database) – as can be shawn by running searches on the database from web interface. There are unexpected projects, such as custom clothing from maps, or Dressmap. More serious surprises are projects like the humanitarian OSM team and the Missing Maps projects – there are issues with the quality of the data, but also in the fact that mapping is imposed on an area that is not mapped from the outside, and some elements of colonial thinking in it (see Gwilym Eddes critique) . The InaSAFE project is an example of disaster modeling with OSM. In Poland, they extend the model to mark details of road areas and other details. All these are demonstrating that OSM is getting close to the next level of using geographic information, and there are current experimentations with it. Projects such as UTC of Mappa Marcia is linking OSM to transport simulations. Another activity is the use of historical maps – townland.ie . One of the roles that Jo play in OSM is part of the data working group, and she joined it following a discussion about diversity in OSM within the community. The DWG need some help, and their role is geodata thought police/Janitorial judicial service/social work arm of the volunteer fire force. DWG clean up messy imports, deal with vandalisms, but also deal with dispute resolutions. They are similar to volunteer fire service when something happens and you can see how the sys admins sparking into action to deal with an emerging issue. Example, someone from Ozbekistan saying that they found corruption with some new information, so you need to find out the changeset, asking people to annotate more, say what they are changing and why. OSM is self policing and self regulating – but different people have different ideas about what they are doing. For example, different groups see the view of what they want to do. There are also clashes between armchair mapping and surveying mappers – a discussion between someone who is doing things remotely, and the local person say that know the road and asking to change the editing of classification. DWG doesn’t have a legal basis, and some issues come up because of the global cases – so for example translated names that does not reflect local practices. There are tensions between commercial actors that do work on OSM compared to a normal volunteer mappers. OSM doesn’t have privileges over other users – so the DWG is recognised by the community and gathering authority through consensus. The discussion that follows this session explored examples of OSM, there are conflicted areas such as Crimea nad other contested territories. Pouria explained that distributed computing in the current models, there are data nodes, and keeping the data static, but transferring the code instead of data. There is a growing bottleneck in network latency due to the amount of data. There are hierarchy of packaging system that you need to use in order to work with distributed web system, so tightening up code is an issue. Rob – there are limited of Big Data such as hardware and software, as well as the analytics of information. The limits in which you can foster community when the size is very large and the organisation is managed by volunteers. Mike – the quality of big data is rather different in terms of its problem from traditional data, so while things are automated, making sense of it is difficult – e.g. tap in but without tap out in the Oyster data. The bigger the dataset, there might be bigger issues with it. The level of knowledge that we get is heterogeneity in time and transfer the focus to the routine. But evidence is important to policy making and making cases. Martijn – how to move the technical systems to allow the move to focal community practice? Mike – the transport modelling is based on promoting digital technology use by the funders, and it can be done for a specific place, and the question is who are the users? There is no clear view of who they are and there is wide variety, different users playing different roles – first, ‘policy analysts’ are the first users of models – they are domain experts who advise policy people. less thinking of informed citizens. How people react to big infrastructure projects – the articulations of the policy is different from what is coming out of the models. there are projects who got open and closed mandate. Jo – OSM got a tradition of mapping parties are bringing people together, and it need a critical mass already there – and how to bootstrap this process, such as how to support a single mapper in Houston, Texas. For cases of companies using the data while local people used historical information and created conflict in the way that people use them. There are cases that the tension is going very high but it does need negotiation. Rob – issues about data citizens and digital citizenship concepts. Jo – in terms of community governance, the OSM foundation is very hands off, and there isn’t detailed process for dealing with corporate employees who are mapping in their job. Evelyn – the conventions are matters of dispute and negotiation between participants. The conventions are being challenged all the time. One of the challenges of dealing with citizenship is to challenge the boundaries and protocols that go beyond the state. Retain the term to separate it from the subject. David Wood talked about Smart City, Surveillance City: human flourishing in a data-driven urban world. The consideration is of the smart cities as an archetype of the surveillance society. Especially trying to think because it’s part of Surveillance Society, so one way to deal with it is to consider resistance and abolishing it to allow human flourishing. His interest is in rights – beyond privacy. What is that we really want for human being in this data driven environment? We want all to flourish, and that mean starting from the most marginalised, at the bottom of the social order. The idea of flourishing is coming from Spinoza and also Luciano Floridi – his anti-enthropic information principle. Starting with the smart cities – business and government are dependent on large quant of data, and increase surveillance. Social Science ignore that these technology provide the ground for social life. The smart city concept include multiple visions, for example, a European vision that is about government first – how to make good government in cities, with technology as part of a wider whole. The US approach is about how can we use information management for complex urban systems? this rely on other technologies – pervasive computing, IoT and things that are weaved into the fabric of life. The third vision is Smart Security vision – technology used in order to control urban terrain, with use of military techniques to be used in cities (also used in war zones), for example biometrics systems for refugees in Afghanistan which is also for control and provision of services. The history going back to cybernetics and policing initiatives from the colonial era. The visions overlap – security is not overtly about it (apart from military actors). Smart Cities are inevitably surveillance cities – a collection of data for purposeful control of population. Specific concerns of researchers – is the targeting of people that fit a profile of a certain kind of people, aggregation of private data for profit on the expense of those that are involved. The critique of surveillance is the issue of sorting, unfair treatment of people etc. Beyond that – as discussed in the special issue on surveillance and empowerment– there are positive potentials. Many of these systems have a role for the common good. Need to think about the city within neoliberal capitalism, separate people in space along specific lines and areas, from borders to building. Trying to make the city into a tamed zone – but the danger parts of city life are also source for opportunities and creativity. The smart city fit well to this aspect – stopping the city from being disorderly. There is a paper from 1995 critique pervasive computing as surveillance and reduce the distance between us and things, the more the world become a surveillance device and stop us from acting on it politically. In many of the visions of the human in pervasive computing is actually marginalised. This is still the case. There are opportunities for social empowerment, say to allow elderly to move to areas that they stop exploring, or use it to overcome disability. Participation, however, is flawed – who can participate in what, where and how? additional questions are that participation in highly technical people is limited to a very small group, participation can also become instrumental – ‘sensors on legs’. The smart city could enable to discover the beach under the pavement (a concept from the situationists) – and some are being hardened. The problem is corporate ‘wall garden’ systems and we need to remember that we might need to bring them down. Next Francisco Klauser talked about Michel Foucault and the smart city: power dynamics inherent in contemporary governing through code. Interested in power dynamics of governing through data. Taking from Foucault the concept of understanding how we can explain power put into actions. Also thinking about different modes of power: Referentiality – how security relate to governing? Normativity – looking at what is the norm and where it is came from? Spatiality – how discipline and security is spread across space. Discipline is how to impose model of behaviour on others (panopticon). Security work in another way – it is free things up within the limits. So the two modes work together. Power start from the study of given reality. Data is about the management of flows. The specific relevance to data in cities is done by looking at refrigerated warehouses that are used within the framework of smart grid to balance energy consumption – storing and releasing energy that is preserved in them. The whole warehouse has been objectified and quantified – down to specific product and opening and closing doors. He see the core of the control through connections, processes and flows. Think of liquid surveillance – beyond the human. Finally, Teresa Scassa explored Crime Data and Analytics: Accounting for Crime in the City. Crime data is used in planning, allocation of resources, public policy making – broad range of uses. Part of oppositional social justice narratives, and it is an artefact of the interaction of citizen and state, as understood and recorded by the agents of the state operating within particular institutional cultures. Looking at crime statistics that are provided to the public as open data – derived from police files under some guidelines, and also emergency call data which made from calls to the policy to provide crime maps. The data that use in visualisation about the city is not the same data that is used for official crime statistics. There are limits to the data – institutional factors: it measure the performance of the police, not crime. It’s how police are doing their job – and there are lots of acts of ‘massaging’ the data by those that are observed. The stats are manipulated to produce the results that are requested. The police are the sensors, and there is unreporting of crime according to the opinion of police person – e.g. sexual assault, and also the privatisation of policing who don’t report. Crime maps are offered by private sector companies that sell analytics, and then provide public facing option – the narrative is controlled – what will be shared and how. Crime maps are declared as ‘public awareness or civic engagement’ but not transparency or accountability. Focus on property offence and not white collar one. There are ‘alternalytics’ – using other sources, such as victimisation survey, legislation, data from hospital, sexual assault crisis centres, and crowdsourcing. Example of the reporting bottom up is harrassmap to report cases that started in Egypt. Legal questions are how relationship between private and public sector data affect ownership, access and control. Another one is how the state structure affect data comparability and interoperability. Also there is a question about how does law prescribe and limit what data points can be collected or reported. The session closed with a discussion that explored some examples of solutionism like crowdsourcing that ask the most vulnerable people in society to contribute data about assault against them which is highly problematic. The crime data is popular in portals such as the London one, but it is mixed into multiple concerns such as property price. David – The utopian concept of platform independence, and assuming that platforms are without values is inherently wrong. The workshop closed with a discussion of the main ideas that emerged from it and lessons. How are all these things playing out. Some questions that started emerging are questions on how crowdsourcing can be bottom up (OSM) and sometime top-down, with issues about data cultures in Citizen Science, for example. There are questions on to what degree the political aspects of citizenship and subjectivity are playing out in citizen science. Re-engineering information in new ways, and rural/urban divide are issues that bodies such as Ordnance Survey need to face, there are conflicts within data that is an interesting piece, and to ensure that the data is useful. The sensors on legs is a concept that can be relevant to bodies such as Ordnance Survey. The concept of stack – it also relevant to where we position our research and what different researchers do: starting from the technical aspects to how people engage, and the workshop gave a slicing through these layers. An issue that is left outside is the business aspect – who will use it, how it is paid. We need the public libraries with the information, but also the skills to do things with these data. The data economy is important and some data will only produced by the state, but there are issues with the data practices within the data agencies within the state – and it is not ready to get out. If data is garbage, you can’t do much with it – there is no economy that can be based on it. An open questions is when data produce software? when does it fail? Can we produce data with and without connection to software? There is also the physical presence and the environmental impacts. Citizen engagement about infrastructure is lacking and how we tease out how things open to people to get involved. There was also need to be nuanced about the city the same way that we focused on data. Try to think about the way the city is framed: as a site to activities, subjectivity, practices; city as a source for data – mined; city as political jurisdiction; city as aspiration – the city of tomorrow; city as concentration of flows; city as a social-cultural system; city as a scale for analysis/ laboratory. The title and data and the city – is it for a city? Back to environmental issues – data is not ephemeral and does have tangible impacts (e.g. energy use in blockchain, inefficient algorithms, electronic WEEE that is left in the city). There are also issues of access and control – huge volumes of data. Issues are covered in papers such as device democracy. Wider issues that are making link between technology and wider systems of thought and considerations. The last day of AAG 2015 is about citizen science and OpenStreetMap studies. As Hilary couldn’t attend the conference, we started the session with a discussion about experiences of enthusiasm – for example, my own experience with IBM World Community Grid. Jeroen Verplanke raised the addiction in volunteer thinking projects, such as logging in to Zooniverse or Tomnod project, and time fly-by. Mairead de Roiste described mapping wood-pigeon in New Zealand – public got involved because they wanted to help, but when they hear that the data wasn’t use, they might lose interest. Urgency can also be a form influencing participation. Britta Ricker – University of Washington Tacoma – Look what I can do! Harnessing drone enthusiasm for increased motivation to participate. On-going research. Looking at the Geoweb – it allow people to access information, and made imagery available to the public, and the data is at the whim of whoever give us the data. With drones, we can send them up when we want or need to. Citizen Science is deeply related to geoweb – challenge is to get people involve and make them stay involved. We can harness drone enthusiasm – they evoke negative connotation but also thinking about them for good – humanitarian applications. Evidence for the enthusiasm is provided by YouTube where there are plenty of drone video – 3.44M – lots of action photography: surfing community and GoPro development. People are attached to the drone – jumping to the water to save them. So how the enthusiasm to drones can be harnessed to help participatory mapping. We need to design a workflow around stages: pre-flight, flight, post processing. She partnered with water scientists to explore local issues. There are considerations of costs and popularity – and selected quadcopter for that. DJI Phantom Vision 2+. With drones need to read the manual and plan the flight. There are legal issues of where it is OK to fly, and Esri & MapBox provide information on where you can fly them. Need to think of camera angle – need also to correct fisheye, and then process the images. Stitch imagery can be done manually (MapKnitter/QGIS/ArcGIS). Possible to do it in automated software, but open source (e.g. OpenDroneMap) is not yet good enough in terms of ease of use. Software such as Pix4D is useful but expensive. Working with raster data is difficult, drones require practice, and software/hardware is epensive – not yet ready to everyone. NGOs can start using it. Idea: sharing photos , classifying images together by volunteers. Brittany Davis – Allegheny College – Motivated to Kill: Lionfish Derbies, Scuba Divers, and Citizen Science. Lionfish are stunning under water – challenging to differentiate between the two sub species but it doesn’t matter if you’re trying to catch them. They are invasive species and are without predators, exploded – especially from 2010. There is a lot of informational campaign and encouraging people to hunt them, especially in dive centres – telling people that it is a way to save a Caribbean reefs. When people transform themselves from ‘benign environmental activity’ to ‘you tell me that I can hunt? cool!’. Lionfish is tasty so having the meat for dinner is a motivation. Then doing ‘lionfish derbies’ – how many can you kill in a day. Seen a lot of enthusiasm for lionfish derbies. Trying to sign up people to where they go but they are not recording where they hunt the lionfish. People go to another site for competition as they want to capture more. REEF trying to encourage a protocol for capturing them, and there are cash prizes for the hunting. They use the catch to encourage people to hunt lionfish. Derbies increase in size – 14832 were removed from 2009 to 2014 and some evidence for the success of the methodology. There was a pressure on ‘safely and humanely capture and euthanase these fish’ – challenge for PADI who run special scuba courses that are linked to conservation. People hear about the hunting and that motivate people to go diving. There is a very specific process of REEF sanctioned lionfish derby, so trying to include recording and public information. But there are challenges below the depth of recreational divers. She also explored if it is possible to improve data collection for scientists. Cheryl Gilge – University of Washington – The rhetorical flourish of citizen participation (or, the formation of cultural fascism?) offered a theoretical analysis of citizen science and web 2.0 as part of a wider project to understand labour relationships and power. She argues that there is agency to the average citizen to link to their environment. They have the ability to contribute, and to receive information is part of Web 2.0. As a technology layer, it changes both the individual and society levels. The collaboration and participation in Web 2.0 is framed around entrepreneurialism, efficiencies, and innovation. The web is offering many opportunities to help wider projects, where amateur and expert knowledge are both valued. However, there is a risk of reducing the politics of participation – semblance of agency. Democratic potential – but also co-opting the spirit is in evidence. There is plenty of examples of inducing individuals to contribute data and information, researchers are eager to understand motivation over a long period. Rational system to explain what is going on can’t explain the competing goals and values that are in action. The desire to participation is spread – fun, boredom etc. From understanding people as ‘snowflakes’ to unashamed exploitation. Why do people contribute to the wider agenda? As provocation, harnessing crowd potential to neoliberalisation agenda of universities. We give freedom to the efficiency and promise of digital tools. Government promise ‘open government’ or ‘smart cities’ that put efficiency as the top value. Deep libertarian desire for small government is expressed through technology. The government have sensors that reduce cost of monitoring what is happening. In the academic environment – reduce funding, hiring freeze, increase in pressure to publish – an assumption that it is possible to mechanically produce top research. Trading in ideas are less valued. Desire for capacity of information processing, or dealing with humanitarian efforts – projects like Galaxy Zoo require more people to analyse the masses of data that research produces, or mapathons to deal with emergencies. Participants are induced to do more through commitment to the project and harnessing enthusiasm. Adding inducement to the participants. She introduce the concept of micro-fascism from Guattari – taking over freedoms in the hope of future promises. It enable large group formation to happen – e.g. identities such as I’m Mac/PC – it is harder to disconnect. Fascism can be defined as an ideology that rely on the masses in believing in the larger goals, the unquestioned authority of data in Web 2.0. Belief in technology induce researchers to get data and participation regardless of the costs. Open source is presented as democracy, but there are also similarities with fascism. Participation in the movement and participants must continue to perform. It bring uncomfortable participation – putting hope on these activities, but also happens in top down and bottom up, and Web 2.0. What is the ethical role of researchers who are involved in these projects? How do we value this labour? Need to admit that it is a political. In a final comment, Teresa Scassa pointed that we need to consider the implication of legitimising drones, killing fish or employing unpaid labour – underlying all is a moral discomfort. Afternoon, the two sessions on OpenStreetMap that Alan McConchie and I organised, taking the 10th birthday of OSM as a starting point, this session will survey the state of geographical research on OpenStreetMap and recognising that OSM studies are different from VGI. The session is supported by the European COST Energic (COST Action IC1203) network: European Network Exploring Research into Geospatial Information Crowdsourcing. Christian Bittner – Diverse crowds, diverse VGI? Comparing OSM and Wikimapia in Jerusalem. Christian looked at differences in Wikimapia and OSM as sources of VGI. Especially interested in the social implications such as the way exclusion plays in VGI – challenges between Palestine/Israel – too contradicting stories that play out in a contested space, and there are conflict and fights over narratives that the two sides enact in different areas. With new tools, there is a ‘promise’ of democratisation – so a narrative of collaboration and participation. In crowdsourced geographic information we can ask: who is the crowd, and who is not? Studying social bias in OSM is a topic that is being discussed in the literature. The process is to look at the database of OSM. Analysing the data and metadata and used the municipal boundaries of Jerusalem. Simplified representation of the city, and region are classified by majority – Arab or Jewish. Then used cartograpms according to size of population and the amount of information collected.In OSM, Jewish areas are over-represented, while Arab areas are under-represented. Bias toward male from privileged socio-economic background as participants. In Wikimapia, the process is tagging places and uses visual information from Google. Wikimapia is about qualitative information so objects are messy and overlap, with no definitions of what consist of a place. In Wikimapia, there is much more descriptions of the Arab areas which are over-represented. The amount of information in Wikimpaia is smaller – 2679 objects, compared to 33,411 ways in OSM. In OSM there is little Arabic, and more Hebrew, though Latin is the most used language. Wikimapia is the other way around, with Hebrew in the minority. The crowd is different between projects. There are wider implications – diverse crowd so diverse VGI? VGI is diverse form of data, and they are produced in different ways from different knowledge cultures. He call for very specific studies on each community before claiming that VGI is general form of information. Tim Elrick & Georg Glasze – University of Erlangen-Nuremberg, Germany – A changing mapping practices? Representation of Places of Worship in OpenStreetMap and other sources. The start of the process is noticing that churches are presented on official maps, but not a masques, noticing how maps are used to produce specific narratives. What happen in new forms of mapping? In Google Maps, the masque is presented, but not the church, in OSM both are mapped. What is happening? In the old topographic maps, the official NMAs argue that it provides a precise representation – but failing to do so in terms of religious differences. Some state do not include non-Christian places of worship – the federal mapping agency came with symbols for such places (masques, synagogues) but the preference from the states NMAs was for a generic mark for all non-Christian places that do not differentiate between religions. USGS just have single mark for house of worship – with cross. The USGS suggested to carry out crowdsourcing to identify places of worship so they are willing to change. 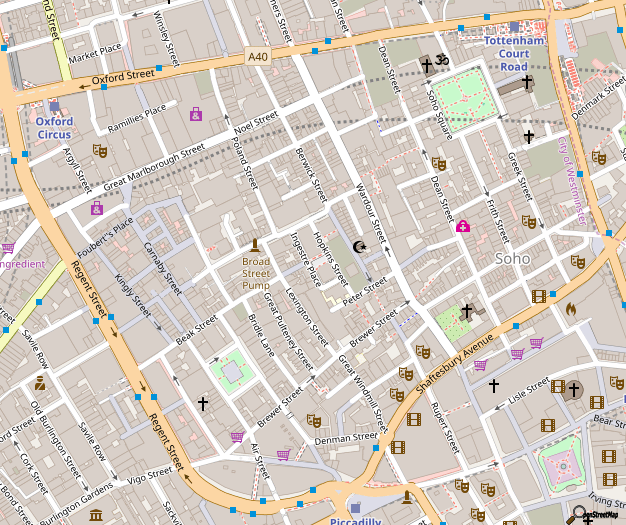 In OSM there are free tagging and marks for religion, but the rendering dictate only some tags. In 2007 there was suggestion to change rendering of non-Christian places. Once Steve Chilton created cartographic symbols for the change. OSM do-ocracy can lead to change, but in other places that use OSM this was not accepted – there are different symbols in OpenCycleMaps. In Germany, there are conflicts about non visible places of worship (e.g. Masque in social club). Adaptive approach to dealing with location in OSM. In Google there is a whole set of data sources that are used, but also crowdsourcing which go to moderators in Google – no accountability or local knolwedge. Places of worship is not transparent. Categorisation and presentation change with new actors – corporate and open data. Google use economy of attention. Alan McConchie – University of British Columbia – Map Gardening in Practice: Tracing Patterns of Growth and Maintenance in OpenStreetMap. Looking at history of OSM. Editing existing features is an important as adding new ones – having to collaborate and dealing with other people data. In the US, OSM is a mixed of volunteer and imported data – it’s ongoing aspect of the project. Questions: do the ‘explorers’ stick around? the people who like empty spaces . Do imports hinder the growth of the community? and does activity shift to ‘gardening’? The TIGER import in 2007 have been significant to the growth of the project. There are also many other imports – address in Denmark, French land cover, incomplete land cover imports in Canada. There was community backlash from people who were concerned about the impact of imports (e.g. Crowe 2011; Fredrik Ramm, 2012, Tobias Knerr, 2015). The debate is also between different regional factions. There is an assumption that only empty areas are exciting. That is problematic in terms of someone joining now in Germany. New best practices that are evolving Imports in Seattle were used to encourage the community and build it. Zielstra et al. 2013 explored imports show different growths, but not so simple as just to pin it on imports. Alan takes the ‘Wiki Gardening’ concept – people who like to keep things tidy and well maintained. Analysing small areas. Identifying blank spots, but trying to normalise across city in the world – e.g. population from the gridded population of the world. Exploring edits per month. We see many imports happening all the time. At individual city, explore the behaviour of explorers and those that never mapped the unknown. In London, new mappers are coming in while at Vancouver the original mapper are the one that continue to maintain the map. There is power law effects that trump anything else, and shift to new contributors and it is not clear cut. Monica G. Stephens – University at Buffalo – Discussant: she started looking at OSM only few years ago, because of a statement from Mike Goodchild that women are not included, so done survey of internet users in Google Maps and OSM. She found that geotagging is much more male – more then just sharing image. In her survey she noticed gender bias in OSM. Maps are biased by the norms, traditions, assumptions and politics of map maker (Harley 1989). Biases – but biases of map maker – bikes in Denver (what interest them), or uneven representation of Hebrew in Jerusalem, or Religious attributes. Also there is how the community makes decision – how to display information? what to import? There are issues of ethos – there are fundamental differences in UK and Germany communities to US mapping communities. This lead to interesting conversations between these communities. There are also comparison, Wikimapia, Google Maps, Topo Maps – the tell us what OSM is doing. OSM democracy is more efficient and responding to communities ideas. The discussions on tagging childcare – rejected but there are discussions that led to remapping of tags in response to the critique. Compare to Google Maps, who was creating local knowledge? in Google Maps 96% of reviewers are male (in Google Map Maker 2012), so the question is who is the authority that govern Wikimapia. Martin Loidl – Department of Geoinformatics, University of Salzburg – An intrinsic approach for the detection and correction of attributive inconsistencies and semantic heterogeneity in OSM data. Martin come from data modelling perspective, accepting that OSM is based on bottom-up approach, with flat data modelling and attributes, with no restriction on tag usage. There are attributive inconsistencies. Semantics heterogeneity is influencing visualisation, statistics and spatial analysis. Suggesting to improve results by harmonization and correction through estimation. There has been many comparison of OSM quality over the years. There is little work on attribute information. Martin suggested an intrinsic approach that rely on the data in OSM – expecting major roads to be connected and consistent. Showing how you can attributes in completeness. Most of the road in OSM are local roads and and there is high heterogeneity, but we need them and we should care about them. There are issues with keeping the freedom to tag – it expose the complexity of OSM. Peter A. Johnson – University of Waterloo Challenges and Constraints to Municipal Government Adoption of OpenStreetMap. The collaboration of MapBox with NYC – agreement on data sharing was his starting point and motivation to explore how we can connect government and citizens to share data. Potentially, OSM community will help with official data, improve it and send it back. Just delivering municipal data over OSM base map is not much – maybe we need to look at mirroring – questions about currency, improvement of our services, and cheaper/easier to get are core questions. Evaluating official data and OSM data. Interview with governments in Canada, with range of sizes – easy in large cities, basic steps in medium and little progress in rural places. No official use of OSM, but do make data available to OSM community, and anecdotal evidence of using it for different jobs unofficially. Not seeing benefits in mirroring data, and they are the authoritative source for information, no other data is relevant. Constraints: not sure that OSM is more accurate and risk averse culture. They question fit with organisation needs, lacking required attributes, and they do see costs in altering existing data. OSM might be relevant to rural and small cities where data is not being updated. Muki Haklay – University College London COST Energic – A European Network for research of VGI: the role of OSM/VGI/Citizen Science definitions. I’ve used some of the concepts that I first presented in SOTM 2011 in Vienna, and extended them to the general area of citizen science and VGI. Arguing that academics need to be ‘critical friends’, in a nice way, to OSM and other communities. The different talks and Monica points about changes in tagging demonstrate that this approach is effective and helpful. Discussant: Alan McConchie – University of British Columbia. The later session looked at intrinsic or extrinsic analysis of OSM – such as Martin’s work on internal consistency, there are issues of knowing specific person in the bits of the process who can lead to the change. There is a very tiny group of people that make the decisions, but there is a slow opening towards accountability (e.g. OSM rendering style on Github). There are translation of knowledge and representation that happen in different groups and identifying how to make the information correctly. There is a sense of ‘no one got the right answer’. Industry and NGOs also need to act as critical friends – it will make it a better project. There is also critical GIS conversations – is there ‘fork’ within the OSM studies? We can have conversations about these issues. Follow up questions explored the privacy of the participants and maybe mentioned it to participants and the community, and also the position as participant or someone who alters the data and as a researcher – the implications of participatory observations. 8:00 1187 #CritGIS: Pedagogies of Critical GIS – session exploring ‘the pedagogy surrounding critical engagement with societal implications of contemporary digital geospatial technologies’, with Matthew W. Wilson, Ellen Kersten, LaDona G. Knigge, Alexander Tarr, Francis Harvey, and Clinton Davis. At the same time, there is a mini-symposium of three sessions, starting with 1156 Digital Connectivity, Inclusion, and Inequality at the World’s Economic Peripheries (papers session) asking ‘what difference people expect better connectivity to make at the world’s economic peripheries’. For most of the day, there are four sessions dedicated to reflection on Public Participatory GIS or Participatory GIS. 2:40 2553 Looking Backwards and Forwards in Participatory GIS: Session IV (Panel session), including Bandana Kar (Chair), and Renee Sieber, Nancy J. Obermeyer, Melinda J. Laituri and myself as panellists. 1:20 3444 New Directions in Mapping 1: Research, jobs, and teaching outside the academy Panel with Britta Ricker (chair) John Bailey, Andrew Hill, Charlie Loyd, Alan McConchie, and Alyssa Wright. There are two session on OpenStreetMap that Alan McConchie and I organised, Taking the 10th birthday of OSM as a starting point, this session will survey the state of geographical research on OpenStreetMap and recognising that OSM studies are different from VGI. The session is supported by the European COST Energic (COST Action IC1203) network: European Network Exploring Research into Geospatial Information Crowdsourcing. A new book has just been published about OpenStreetMap and Geographic Information Science. The book, which was edited by Jamal Jokar Arsanjani, Alexander Zipf, Peter Mooney, Marco Helbich is “OpenStreetMap in GISciene : Experiences, Research, and applications” contains 16 chapters on different aspects of OpenStreetMap in GIScience including 1) Data Management and Quality, 2) Social Context, 3) Network Modeling and Routing, and 4) Land Management and Urban Form. I’ve contributed a preface to the book, titled “OpenStreetMap Studies and Volunteered Geographical Information” which, unlike the rest of the book, is accessible freely. 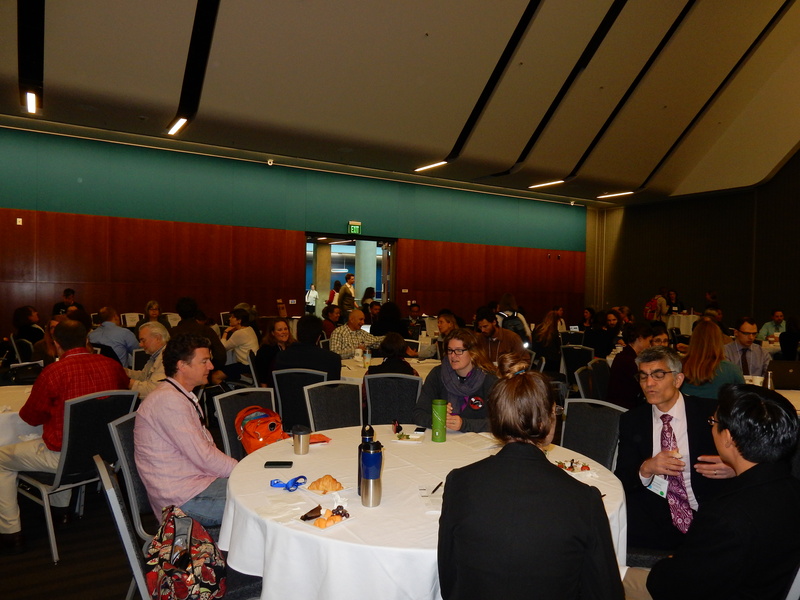 After a very full first day, the second day opened with a breakfast that provided opportunity to meet the board of the Citizen Science Association (CSA), and to talk and welcome people who got up early (starting at 7am) for another full day of citizen science. Around the breakfast tables, new connections were emerging. Similarly to the registration queue in the first day, people where open and friendly, starting conversations with new acquaintances, and sharing their interest in citizen science. An indication to the enthusiasm was that people continued talking as they departed to the morning sessions. The session explored the use of different data collection tools to capture and share traditional knowledge. Dawn Wright, Esri chief scientist started with Emerging Citizen Science Initiatives at Esri. Dawn started with Esri view of science – beyond fundamental science understanding, it is important to see science as protecting life, enabling stewardship and to share information about how the Earth works, how it should look (geodesign) and how we should look at the Earth. As we capture the data with various mobile devices – from mobile phones to watches and sensors we are becoming more geoaware and geoenabled. The area of geotechnologies that enable it – are apps and abilities such as storytelling are very valuable. Esri views geoliteracy as combination of understanding geography and scientific data – issues are more compelling when they are mapped and visualised. The Collector for ArcGIS provide the ability to collect data in the field, and it has been used by scouts as well as in Malawi where it is used by indigenous farmers to help in managing local agriculture. There are also abilities to collect information in the browser with ‘GeoForm’ that support such data collection. Maps were used to collect information about street light coverage and buffering the range that is covered. A third method is a StoryMaps.arcgis.com that allow to tell information with a narrative. Snap2Map is an app that allow to link data collection and put it directly to story-maps. There is also a crowdsource.storymaps.arcgis.com that allow collection of information directly from the browser. Michalis Vitos, UCL – Sapelli, a data collection platform for non-literate, citizen-scientists in the rainforest. Michalis described the Extreme Citizen Science group – which was set up with the aim to provide tools for communities all over the world. In the Congo-basin communities face challenges from illegal logging and poaching , but forest people have direct competition for resources such as the trees that they use, and with the FLEGT obligations in the Republic of Congo, some protection is emerging. The team collaborate with a local NGOs which works with local communities, and there are challenges including literacy, energy, and communication. Sapelli collector is an application work with different levels that allow the data collection area. The Sapelli launcher locks the interface of the phone, and allow specific functions to be exposed to the user. The issue of connectivity was address in communication procedures that use SMS. The issue of providing electricity can be done in different ways – including while cooking. There is a procedure for engaging with a community – starting with Free and Prior Informed Consent, and the process start with icons, using them in printed form and make sure that the icons are understood – after the agreement on the icons, there is an introduction to the smartphones – how to touch, how to tap and the rest of the basics. The next stage is to try it in the field. Sapelli is now available in Google Play – the next stage is to ensure that we can show the participants what they collected, but as satellite images are difficult to obtain, the group is experimenting with drone imagery and mapping to provide the information back to the community. In terms of the results to the community, the project is moving from development to deployment with a logging company. The development of the icons is based on working with anthropologists who discuss the issues with the community and lead the development of the icons. Not all the icons work and sometime need to be change. The process involved compensating the community for the time and effort that they put in. Sam Sudar, University of Washington – Collecting data with Open-Data-Kit (ODK) – Sam gave a background on the tool – the current version and the coming ODK 2.0. ODK is information management tools for collecting and storing data and making it usable, targeted at resource-constrained environment – anywhere where there is limited connectivity, without assuming smartphone literacy. It is used all over the world. It is being used in Kenya, and by Jane Goodall Institute (JGI) in Tanzania, the Surui tribe use it in Brazil to gain carbon credits, and the Carter Center in Egypt for election monitoring, as well as WWF in Rwanda. The technology is used in very diverse ways. Need to consider how technology empowers data collection. The ODK workflow is first, build the form, collect the data, and finally aggregate the results. ODK build / ODK XLSform is the way to build it in Excel, then there is ODK collect to render the forms, and finally ODK aggregate can run locally or on Google App Engine. There is a strong community around ODK with much support for it. In ODK 1.0 there is no data update on the mobile device, as it replicated the paper process. There is limitation for customisation of the interface, or linking to sensors. ODK 2.0 can provide better abilities and it allow syncing of information even it is done on the cloud. The ODK survey replacing ODK collect, and the ODK tables is a way to interact with data on the device. The intention is to make it possible to interact with the data in an easier way. A question from the audience asked if local communities worries about the data collected about them? ODK work with a lot of medical information, but the team doesn’t goes on the ground so it is left to whoever use the system to ensure ethical guidelines are followed. Michalis noted that there are not only problems with external body, but also cultural sensitivities about what data should be seen by whom, and there is an effort to develop tools that are responsive to it. Tanya Birch, Google Earth – Outreach Community-based field data collection and Google mapping tools the video include Jane Goodall work in Tanzania with Chimpanzee, due to habitat lost, there are less than 300,000 chimpanzee left in the wild. In the video, Lillian Pintea (JGI) noted the importance of satellite images that demonstrate all the bare hills in the area of Tanzania. That lead to improve the life of the local villagers so they become partners in conservation. The local communities are essential – they share the status of the work with the people in the village. The forest monitor role is to work across the area, collect data and monitor it to ensure that they can collected data with ODK. Location information is easier in tablet and then upload it to Google, and then it is shared with global effort to monitor forests. Gombe national park is the laboratory for scaling up across the area of habitat of Chimpanzees and using Google abilities and reach to share it widely. Kevin Crowston (Syracuse U.) & Andrea Wiggins (U. Maryland & symposium convener): Project diversity and design implications describe a survey in which most attention was paid to small projects, and by surveying a wider range of projects they discover different practices. To evaluate the design implication they suggested that we need to understand what the goal of the project, the participation activities – from science, conservation, to photography – different things that people are doing, with observations is the most common type of contribution (see First Monday paper). Data quality come up in all the projects and there are different strategies to deal with it. There are diversities of engagement – from conference and meetings to social media. There are also rewards for participation – some projects are not doing rewards at all, others provide volunteer appreciation, training , equipment and another approach is to provide competitive rewards in leaderboards. There are also socialisation – and even formal education. Funding – diverse, from grants, private contributions, to sponsorship and sustainability is an issue. -Anne Bowser (U. Maryland) Gamifying phenology with Floracaching app – geocaching for plants – the application focuses on phenology and earlier version was developed for Project BudBurst. Traditional volunteers focus contribution to science, while millennials might be interested in mobile app that is based on games. Embedded maps can be used to create a cache and there is a leader-board and points. Floracaching was created from paper prototyping and focus groups. They found perception of gamification was important to millennials, they also enjoyed competition. Also wanted to be told what to do and feedback on how they’ve done. ‘I’m not going to drive an hour to see a plant bloom’ . Missions can be added to the design and help people to learn the application and the data collection. -Matt Germonprez, Alan Kolok, U. Nebraska Omaha, & Matt Levy (San Francisco State U. ): Enacting citizen science through social media – Matt come from a technology angle – he suggested that social media is providing different form of information, and social media – can it be integrated into a citizen science projects. The science project is to monitor Atrazine which started in 2012, with a process similar to a litmus test, the project worked, but they wanted to use social media in the social setting that they work. Facebook wasn’t used beyond the information, but Twitter and Instagram was used to report observations publicly. The problems – no social conversations, so the next stage they want to maintain social conversation as the next goal. The project can be found when you search for Lil’ Miss Atrazine. -Jen Hammock (Smithsonian Institution): An infrastructure for data distribution and use, the aim of the project of looking at snails – findability problem, a tool that they want to develop is for data search – so following different sources for information, and merging the taxa, location, as well as providing alerts about interests. Notification will be provided to the researcher and to the contributor. There can be knowledge about the person that contribute the information. There are technical and social barriers – will researchers and experienced naturalists be interested in sharing information. -Yurong He (U. Maryland): Improving biodiversity data sharing among diverse communities. looking at biodiversity – and the encyclopaedia of life. There are content partners who provide the data. She looked at 259 content partners and found 6 types of data providers – and they are professional organisations that operate over time such as IUCN, NHM etc. The second type is repositories, professional database emerge in the 1990s. There are citizen science intiative and communities of interest, such as Xeno-Canto for bird song. Fourth, social media platforms such as wikipedia, Fifth, education communities who add information while they focus on education and finally subsidiaries. We need to know the practices of the providers more to support sharing of information. -Stuart Lynn, Adler Planetarium & Zooniverse: Developing tools for the next scientific data deluge. Stuart discussed about their online community. They have 1.2m users. The challenge in the future is that there are going to be many projects and data sources that give huge amount of data. The aim is to partner with machine learning algorithm developers but how to keep the crowd interested and not just give the most difficult cases with no opportunity to learn or progress slowly. Gamification can be stressful, so they try to give more information and learning. They also try to create a community and discuss the issues. There is huge distribution of comments – and deepening engagement. There is no one size fits all and we need to model and understand them better. -Jenny Preece (U. Maryland): Motivating and demotivating factors for long-term participation – what motivate people to come back again and again. The different motivational aspects – describing the work of the late Dana Rotman who collected information in the US, India and Costa Rica. 142 surveys from the us, 156 from India and also interviews in the three countries. She used grounded theory approach and developed a framework initial, and for long term impact there are internal and external motivation. Demotivations – time, problems with technology, long commitment with the task. -Carsten Oesterlund, Gabriel Mugar, & Kevin Crowston (Syracuse U. ): Technology features and participant motivations, the heterogeneity and variety of participants – how might we approach them? people change over time? looking at zooniverse – specifically planet hunters, there are annotations, talk and other sources of information. The talk pages – new comers and encouraged to annotate and comment about the image and also looking at what other people have done. They also find people that are more experienced. Use of talk change over time, people start putting in comments, then they go down and stop commenting and then later on started putting more information. There is also role discovery in terms of engagement and what they do in their community. -Charlene Jennet (UCL): Identifying and promoting creativity – creativity is a puzzling question, which is debated in psychology with some people look for breakthrough moment, while other look at everyday creativity. There are examples of projects that led to creativity – such as foldit, in terms of everyday creativity in citizen cyberscience and conducting interviews with volunteers and results include artwork from the old weather forum or the Galaxy Zoo Peas and eyewire chatbots that were created for members. People who are engaged in the project are contributing more to the project. Providing feedback on progress is important, and alos regular communication and personal feedback in blogs and answering in tweeters. Event help and also need to have ability role management. -Carl Lagoze (U. Michigan) Inferring participant expertise and data quality – focusing on eBird and there is a paper in big data and society. The standard way is to control the provenance of the data. The library is creating ‘porous zone’ so today there is less control over the who area. There are barriers that break down between novices and experts. How can we tell experts/non experts – this happen across areas, and it is sort of distributed sensor network with weak sensors. are there signal in the data that help you to identify people and the quality of their information. Mikel Maron (Humanitarian OpenStreetMap Team) Mikel covered what is OpenStreetMap (OSM), the OSM foundation is a different entity than Wikimedia, which is confusing. OSM are a very wide community of many thousands of people that continue to contribute. Humanitarian OpenStreetMap Team (H.O.T) is following the ‘Cute Cat theory for humanitarian maps’ – use something that is alive and people are used to contribute to, when you need it in emergency situations. OSM is used in many organisation and projects in government. Attempts to map all these organisations is challenging. In Bangladesh, there are 6 OSM projects and require cooperation between agencies – at least all projects contribute to the same database. Organisations find it challenging that they need to support but can’t control. Starting from Gaza in 2009, OSM community started to map the area although there was no specific request. OSM was eventually used to create local tourist map. The community in Gaza didn’t continue – providing long term support is difficult.Haiti 2010 helped in producing the data and it was difficult to coordinate, so that led to the tasking manager. MapGive is providing support through imagery to the crowd – a way to support OSM by utilising the DigitalGlobe database. There are development of linking OSM and citizen science. There is very rich data in OSM and there is need to understand social science and data research. Caren Cooper opened with a list of issues: participation vs exploitation; beneficence, maleficence, autonomy and justice; incentives vs manipulation; IP and data ownership; data misuse, sharing accessiblity; opennes vs privacy and security; cultural competence. Holly Menninger led yourwildlife.org – the project that she focusing on – home microbiom at home. Asking dust samples from home that volunteers share and they look at the content. Volunteers want to understand their home but also the science. There was the issue of reporting back to participants – They want to understand the information, and they provided some information and it was a challenge to translate the scientific information into something useful. People are interested in the information at home, sometime due to personal issues – e.g. request to get the results because someone is ill in the house. There is a lag of 2 years between samples and results, and it need to be explained to the participants. There is also an issue that the science is exploratory, which mean that there are no specific answers that can be answered for participants. Madhusudan Katti explored the appropriation of citizens knowledge. In the realm of IP in traditional knowledge is discussed a lot. Appropriating local knowledge and then publishing when the information came from local knowledge through interviews – but the scientists get the fame. Collecting information about engendered species where there is risk from local community. he mentioned the film Living with elephants which focus on the conflicts between humans and elephants but that also might help poachers. Janet Stemwedel highlighted that even participant-led citizen science can be helped with DIY science. DIY science it is self efficacy, and control the process, so if the participants running the show, than what can go wrong? Who better to protect my autonomy than me? The answer that autonomy is tricky and need good information about potential risks and benefits and your current choices can hurt future prospects for choosing freely (don’t use autonomy to get addicted, or what you do with your personal information), finally our exercise of autonomy can impact others’ prospects of free choice (DNA analysis have an impact on your wider family). Institutional Research Board (IRB) is a mechanism to think it through – potential consequence (good and bad), who could be impacted? strategies for answering the question. Reasons to resist IRB – not legally required, and the academic scientists complain about it, as well as no access to an IRB. The reason to get over the resistance is that unintentional harm is not a good thing, also to get feedback from more eyes helped to know about tools and approach. Ethical objectivity is to go beyond just gut feeling and discuss with other people. Anne Bowser discussed the ethics of gamification – the use of game design elements in non-game contexts (using leader boards). Old weather had an element of games, and also the floracaching as an example. There is labour/exploitation too – in games such as Civilization II is done for fun, while you learn about history. Online games are using different approaches to extract more from their users. Does contribution to science cleanse the ethical issues because it’s not for motives? crowdsourcing was critique in different ways. There are also tracking and privacy, so it also provide habits and all sort of details about the users (e.g. in foursquare) – salesforce is getting badges to encourage people to act in specific ways as employees. Ethical citizen science: treat participants as collaborators; don’t waste volunteer time; volunteers are not computers (Prestopnik & Cowston 2012). Ethical design allow participants to be aware of the implication and decide if they want gamification or not. Lea Shanley – covering data privacy – her awareness came from working with Native American tribes, with participatory mapping. Tribes started to use participatory GIS. There were many things they wanted to map – and the participants had difference in views about sharing the data or not. Some places were careful and some was not. In disaster response, there is all the social media curation, and many people that are open data evangelist and they started sharing location of first aiders location and actually risking them. In citizen science, there is lack of attention to location – places were they recorded, and even real time information that risk physical security of participants. Face recognition is possible. Information collected by volunteer can reveal medical information that can harm people prospects. sensitive information, sacred sites location, endangered species. Toxic environments can risk volunteers. There are also issues with who interpret and manage the data. social norms and reinforcing social norms. An emerging area is security of social media – crowdsourcing teams where hacked in DARPA red balloon challenge. There can be issues with deliberate hacking to citizen science from people who don’t like it. Dianne Quigley – Northeast Ethics Education Partnership, that came from issues of environmental and social justice to improve ethical knowledge of researchers. When researchers start with a community they start with discussion of risk/benefits and consider who is getting something out of it. Training graduate students to know how to work with communities. avoid harming – non-maleficence; also informed consent of working with communities, protecting data; justice is a way to think of linguistic diversity, respect to local knowledge, and also recruitment in a fair way in terms of representation. Data management and protocols. There is a need to learn humility – to respect the needs and practices of the community. There are ideas to start an ethics group in the CSA and consider code of ethics or participant bill of rights. do we need to extend IRB oversight? co-created common rule? is there a value in code of ethics or will it be a dead word? The discussion explored the need bottom up projects which also need to consider the impacts and outputs, communication with the public and promising what the research will deliver, and the investment of time in citizen science by early career researchers can also impact their career prospect. These are challenges that are common in community participatory research. The panel is specifically reflecting on the citizenship aspects of citizen science. Citizen science is a significant phenomena, and feeling that need a critical voice within it. What is the place of the citizen in citizen science? question about governance, methodologies practices and methodologies. How does it connect to wider democratisation of knowledge? Eugenia Rodrigues (University of Edinburgh, UK) asked: what model of citizenship it promotes? one way is to look at the demographics, but we can ask about the term – possible to use volunteer, amateur, or extended peer community (as in Post-Normal Science). The term citizen include autonomy, creativity, liberty , responsibility, having a stake and other meaning. What are the citizens doing and are we constructing a story that recognises the citizen scientists as a citizen? The story that is appearing in work in North-east of England dealing with water pollution in local woodland, where they noted that the Environment Agency was not doing things satisfactory way, so their need of their local habitat was overlooked. In this case we have contextual/experiential knowledge and expert monitoring skills to lead to a change. Citizen science can be seen as counter expertise. We need to include – some classification are trying to control the role of the citizens, the need to control levels of participation to improve quality, do not give space for participants to exercise their citizenship fully. Shannon Dosemagen (Public Lab) – in public lab there are specific attention to environmental monitoring and there is a need to re-imagine the role. In public lab they prefer to use civic science or community science and not citizen science because it can be controversial or different in different places. They also think of scientists and non-scientists not in a supplicant way. Consider how engage people in the whole process. Different roles play out in different ways – they want to be active about it. There are different roles within the community of public lab but it is about egalitarian approach to roles? Esther Turnhout (Wageningen University) looking at expertise and quality control in citizen science networks for biodiversity knowledge. Biodiversity knowledge is existing in amateur naturalists and they started using the term citizen science. To conceptualise – there are complex relationships with mainstream science. Biodiversity recording been around for a long time and the data is increasing demand for decision making. What it brought with it is demand to professionalise and increase standards and quality. The validation is the complex networks of amateurs, experts, professionals and decision makers – looking at actors in the network. Validation is done in different places with different motivations – there are hierarchical network inside the naturalists groups and enforcing them with novices. The digitise data is compared with existing observation and there is reciprocity between observer and the process of collecting and organise the data. There are lots of things – butterflies, community of observers, the field guide – the process is circular. But increasingly, validation is imposed and procedural. Validation seizes to be collective and the records no longer circulate. The main concern is to keep check where the data go and belong to the observer. The citizenship dependent on not just turning the data into probabilities. There is a need to maintain control over the data. Rick Hall (Ignite!, UK) there been different learned societies around the country – the learned societies that emerged from the 18th century, the acts of enclosures and the workhouses enslaved large groups in society. Today, we can ask about Internet barons if they are trying to do the same as mill owners. There is a cultural entitlement in the human right declaration. The current president of the Royal Society – finding things for yourself is at the very heart of science. It matter where it takes place – for example in a popup shop that allows community curiosity labs and explore questions that matter to them. Spaces in schools that young people can take ownership over their investigations. In spaces like Lab_13 are spaces to learn how to become a scientist. The issues are asking young people what people want to know know. We need spaces where citizens learn not just science but how to become scientists… We need more community and civic citizen scientists because the world need more curios minds. Erinma Ochu (University of Manchester, UK) – as a neuroscientist she found her research that it requires empathy and stories as a way the science evolved as powerful and controlling. What happen when you bring science to the public realm? How to ensure that it is inclusive for women and minorities? For me, the discussion highlighted that it was mostly about collective action and egalitarianism in the production of knowledge -so expertise without hierarchy. The final keynote was from Amy Robinson EyeWire: Why Do Gamers Enjoy Mapping the Brain? demonstrating the game and how it works. Lessons from EyeWire – it’s been running for 2 years and a lot of things that were learned. The idea: if we build it, they will play – that’s not happen. Actually, carefully crafted, slowly built community – creating the tools, learning about how things are used. Media is crucial – 60% of eyewire registration came within 5 days of major media event. Major media event is in facebook, twitter and other social media – suddenly things are coming from media. Facebook page can convert viewers to participants. Media relations are an active engagement, not just waiting for journalist – share all sort of things, and funny things. Reaching out to media also require being prepared to it – and you need to cope with it and capture it. Create internal analytics to understand how the project works. Engagement is also a major issue – there is a huge drop off after two months. By creating games and missions can provide a reason to capture people’s interest. Prestige within the community can work to motivate them – changing the user handle colour can demonstrate the recognition by the project. There are also specific challenges and set their own challenges. Accuracy and efficiency – using the power players in the game to have a bigger role in the project. How do you recognise a potential power players in your game? Design of the entry page is critical – the page is minimalist and reduce the amount of information that you need to enter the system. They have created all sort of interesting collaboration such as fascinating visualisations. There is also need to take risks and see if they are going to work or not. Abe Miller-Rushing close the conference asking people to share talks and links, as well as posters will come online. We are aiming to create a community and serve the needs. The new board chair, Greg Newman continue with some take aways from the conference which completed the conference.